Summerton Mill is a tumbledown watermill nestled deep in a beautiful valley. And 'when the waterwheel turns at Summerton Mill, a little bit of magic takes place and, for a little while - everything goes back to how it used to be'. At the end of each episode, 'as the water level drops back down, the big old waterwheel slows and eventually - stops. And Summerton Mill, still beautiful in its tumbledown state, goes back to being a home, just to the wild animals, the birds and the plants'. Each episode features life in the Summerton Valley. Dan lives in Summerton Mill with his faithful old furry friend, Fluffa. Mrs Naybhur and Dr Naybhur live up the track in Mill Cottage. And then there's Mousey-Tongue, the laziest cat in the whole world, the little round 'yellow spinner' chickens, Francoise the French cow with hairy armpits, and a collection of small scampering millfreaks which are a bit of a cross between hedgehogs and rabbits. Twenty-six episodes were commissioned by the BBC in 2002 for CBeebies, and the twenty-six episodes in Series 2 have been broadcast in over eighty countries around the world but, sadly, have never been broadcast in the UK. Summerton Mill was created and produced by Pete Bryden and Ed Cookson from their Oxfordshire studio. The first series was animated by Pete Bryden, Ed Cookson and James Cleland. The second series was animated by Pete Bryden, Ed Cookson, James Cleland, Dan Stirrup, Hannah Watkins and Abi Mendoza. Set building, character design, model-making, scriptwriting, filming, editing was undertaken by the production team. Character voices and narration were provided by Silas Hawkins whose father, Peter Hawkins, voiced such classics as The Woodentops, Captain Pugwash and Bill and Ben, the Flowerpot Men. 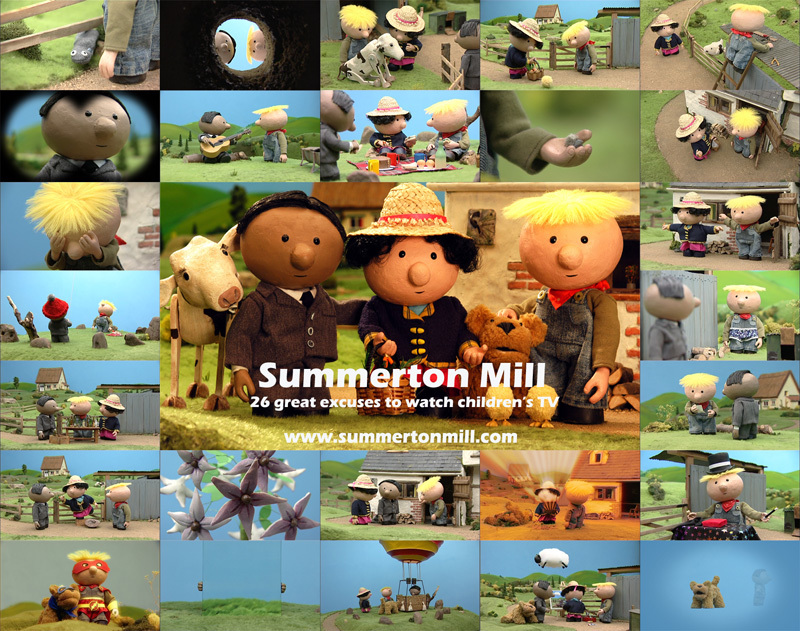 The BBC commissioned thirteen five minute episodes of Summerton Mill as inserts for its flagship studio preschool series Tikkabilla, which used the Playschool format. After a few months, Summerton Mill was given its own time slot. At it's prime, Series 1 was being shown within Tikkabilla and also in it's own slot on BBC1 and BBC2 with several broadcasts per day. The production team then went on to self-fund and create Series 2 - a further thirteen five minute episodes. Despite being sold to over eighty-five countries around the world, the thirteen Series 2 episodes were never broadcast in the UK. It's another glorious day in the Summerton Valley. Mrs Naybhur fills some old bottles with water to make a bottle organ. She, Dr Naybhur and Dan all have a go. Interesting Note: unfortunately, we managed to delete our Google Account and the twenty-six episodes which were available on YouTube have all gone, so we're in the process of re-uploading them. The Bottle Organ had 18,821 views, and all those statistics have disappeared into the ether - grrr! Anyway, here it is. We'd love to hear from you, so please do leave us a message. Dan finds a present on top of the chicken house and he thinks that it’s for him.